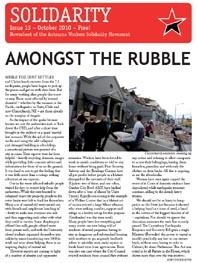 The 13th issue of Solidarity, free newssheet of the Aotearoa Workers Solidarity Movement. Download the .pdf below (1.37MB), or visit the AWSM website to read the contents online. * A Mini Strike Wave? Note: This will be the last issue for 2010, Solidarity will resume publication in early 2011. News and analysis will continue to be posted on the AWSM website until then. Or, you can subscribe to the print edition to receive a copy of Solidarity in the post. $8 for 12 issues. Mail a cheque to AWSM, PO Box 6387, Wellington 6141, or contact us to organise an alternative method of payment.